Jude was diagnosed with unilateral retinoblastoma when he was eight months old and he had surgery to remove his right eye just a few days later. Thankfully, Jude didn’t need chemotherapy or any further treatment for the cancer, however the disease has left its lifelong legacy in the form of Jude’s artificial eye. Jude is now four years old and last September we took the decision to move Jude from his nursery, where he had been since prior to his diagnosis, to the preschool which is part of his future primary school. The majority of children attending the primary school join in the preschool year and we wanted him to have plenty of time to settle in before starting Reception. We were happy with our decision but as his start day loomed closer we began to feel the enormity of the move. 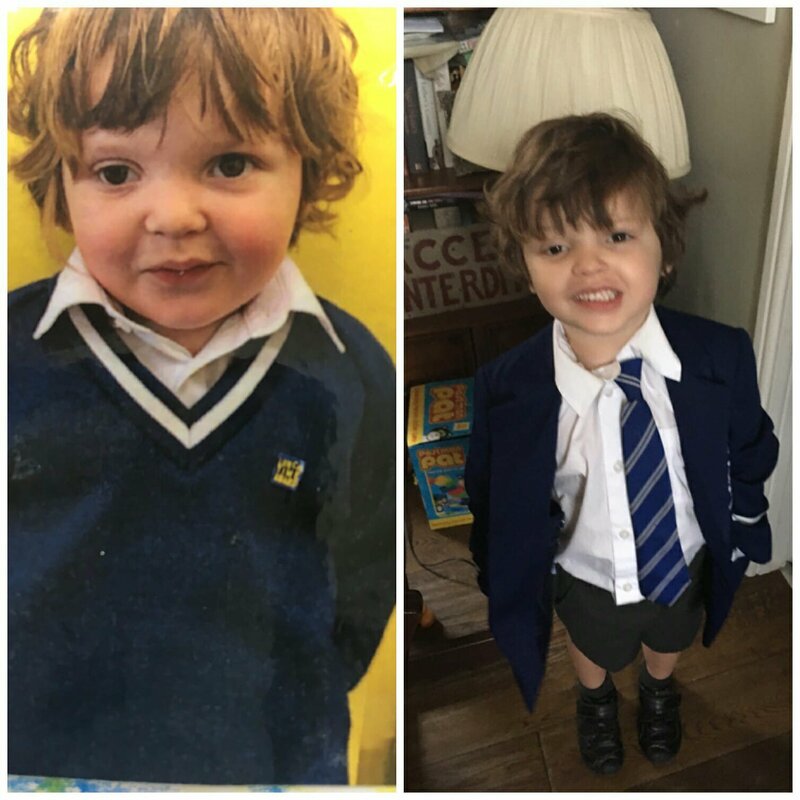 Jude’s new preschool class is very much a part of the wider school – he would wear full school uniform, share his meals and playtime with the rest of the infants and spend both breakfast and afterschool club with children as old as 11. Jude’s nursery had always been fantastic. They took his diagnosis and the loss of his eye in their stride, they knew how to clean Jude’s eye if it became gunky and they knew how to put it back in if it came out. His friends had been completely accepting of his eye in the way that younger children generally are and he had never felt that he was different. Would school be the same? When in doubt, my solution is to research as much as possible and this was no exception. The CHECT website is full of helpful information about starting school, covering every potential aspect of a child’s treatment journey and the likely impact on their day-to-day life. For Jude, this means how to manage his artificial eye and the adjustments that need to be made for a child with monocular vision – from ensuring that Jude wears his goggles for swimming lessons to making sure that he is sat the correct side of teaching resources to have full visibility. We printed off the relevant pages, along with some photos of Jude without his eye in, and gave this information pack to Jude’s new teacher. The school have been brilliant, wanting to understand every possible way that they can help Jude. 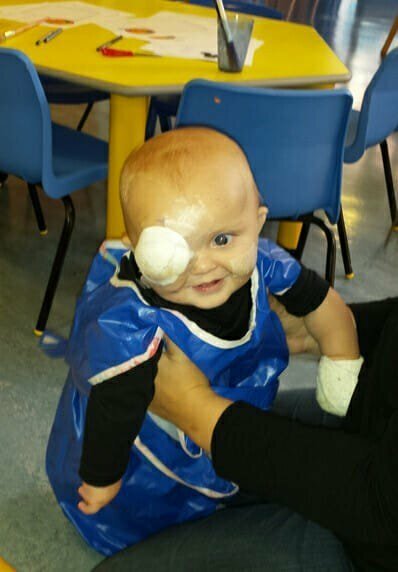 They have had no hesitation in learning how to clean his eye and even how to put it back in if required. Jude was encouraged to bring in one of his old eyes, along with Elli the Elephant who also has a special eye, to show to the rest of his class. The other children have been curious but not fazed and Jude has settled into school wonderfully. There are still moments that are hard and I imagine there always will be. Just a few weeks ago I was standing on the side lines at sports day about to watch Jude run his first race, when I was overcome with a sudden worry that he wouldn’t be able to stay in his own lane.Should I have asked for him to run in the outside lane so that there wasn’t a child on his right to bump into? Or is he better in the middle lane where he can see a child to his right running ahead of him? I needn’t have worried, not least because none of the children stayed in their lanes as they charged towards the finish! Starting school is a big step for any child, but for the parents of a child who has had retinoblastoma the worry will always be greater. Emotionally, our families have already been through so much and practically, there are so many more things that need to be considered in ensuring the right provision for our children. Jude is different, but then so is every child. They all have their own strengths and weaknesses, new skills that they pick up instantly and others that they take longer to master. His school report spoke of a happy, confident child who is thriving and more than ready to start Reception in September. We are so proud of our little boy, so appreciative to CHECT for their ongoing support and resources and so grateful for Jude’s wonderful teachers. If your child is starting school in September, we have some useful resources to help. Please have a look at our in school or nursery information and artificial eyes school action plan. And don’t hesitate to get in touch with your support worker if you have any questions or concerns.